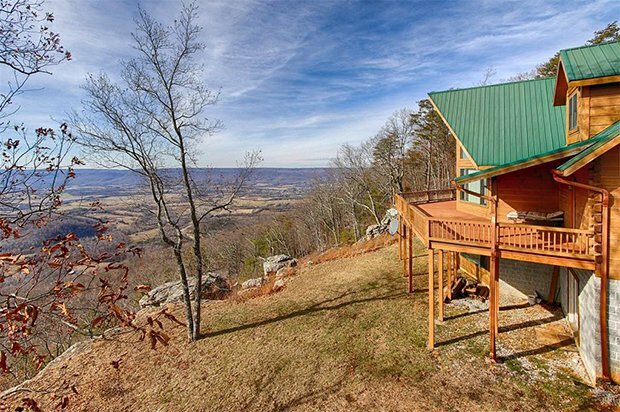 This large and luxurious log cabin sits atop a mountain in Pikeville, Tennessee. Custom built by hand, this lavish residence has a classic look packed with modern conveniences. Built with hardwood and a brick layered foundation, the structure stands firm, overlooking the Sequatchi Valley. 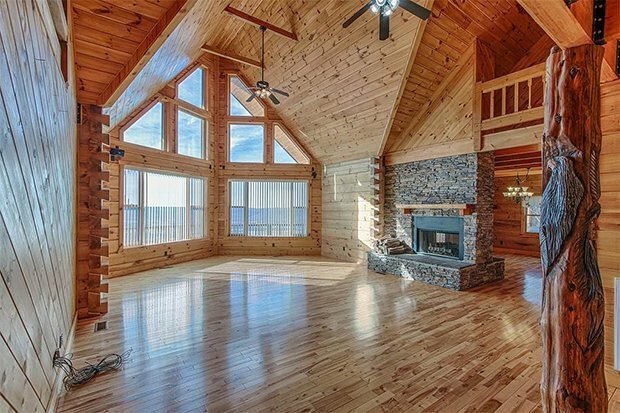 The timber used is finished with some gloss making the walls and flooring look warm and rustic, but clean and crisp. 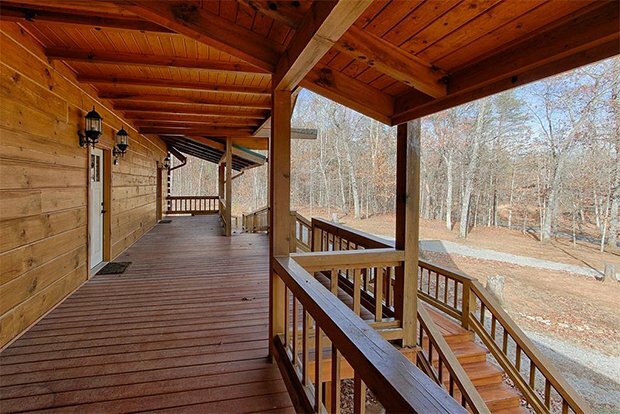 Wooden stairs lead up to the front porch. Wide and covered, it is perfect for receiving guests, and for lounging be it rain or shine. Inside is a spacious interior, with high ceilings and open floor plans. The place looks elegant, large windows bring in natural light which are reflected on polished hardwood to really brighten up the insides. The main level is an open floor plan, with a master suite, kitchen, office, and living area ready to be filled in with your choice of furniture. A beautiful hand carved totem pole stands spanning the two levels of the house. The see through stacked stone fire place works with a central heating system, keeping temperatures stable year round. The kitchen comes fully furnished with a stove, fridge, ovens, sink, and long counter tops. It also features a lot of storage spaces scattered throughout the area, along with a large walk-in pantry. The office has several wooden work desks and a file cabinet. The upper level is composed of three bedrooms, with two full baths, and a private balcony. The rear deck is very wide, with open and shaded areas, greatly expanding the living space. 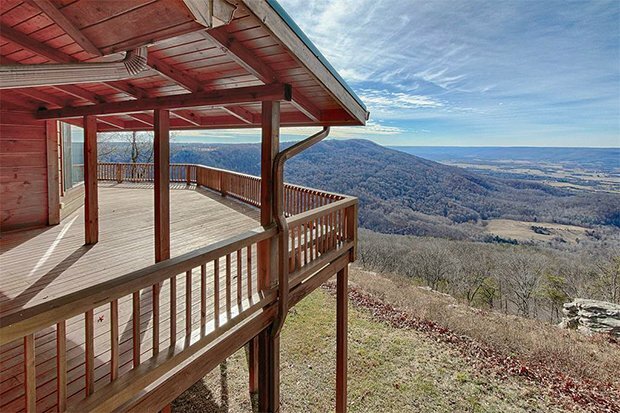 The view from the deck is amazing, and it can serve as a common area for large outdoor gatherings. 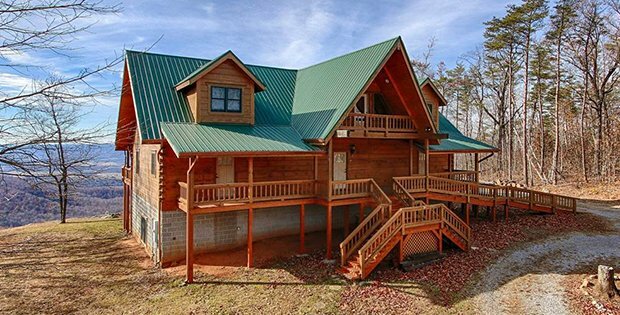 This luxurious log cabin is beautifully made and packed with a lot of potential potential. 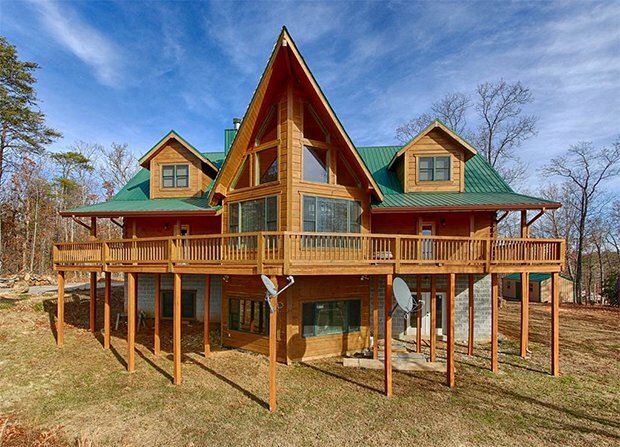 For any homeowner lucky enough to live here, the place sits on 2.65 acres of land, with 10 lots serving as additional privacy buffer. It is up in the market for the hefty sum of $400,000. Take a look through these photos and tell us what you think on our Facebook Page!